His State of the Union speech included a call for unity — and the Democrats who want to take President Donald Trump's job in 2020 were united in not buying it. 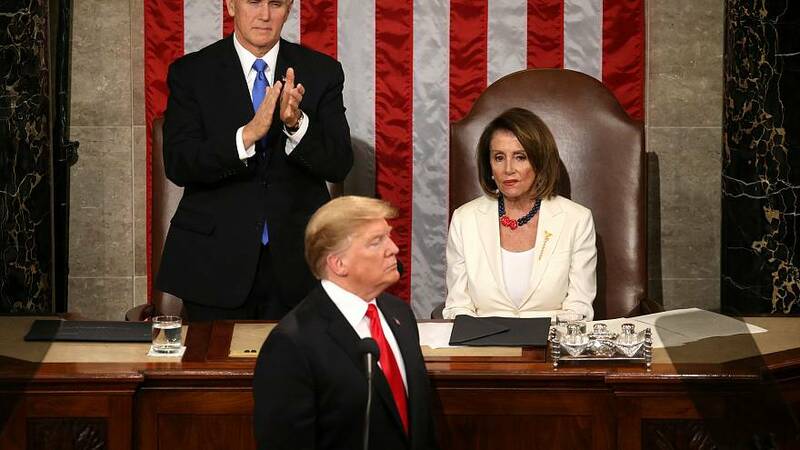 "We must reject the politics of revenge, resistance and retribution, and embrace the boundless potential of cooperation, compromise and the common good," Trump said in his speech. "We can bridge old divisions, heal old wounds, build new coalitions, forge new solutions, and unlock the extraordinary promise of America's future. The decision is ours to make." But the 2020 presidential candidates found little common ground with Trump's agenda and were unimpressed by his "unity" claims. Sen. Kirsten Gillibrand, D-N.Y., let her expressions do the talking. Her staff tweeted out a GIF of her rolling her eyes and sighing during Trump's speech. The meme read, "Agree? Chip in $5 so we can put an end to this," and included a link to her campaign website. "If the President wants unity, he can start be uniting all the children and parents his administration tore apart from each other at the border," tweeted Julián Castro, the former housing secretary, former mayor of San Antonio, and current 2020 Democratic presidential contender. Rep. Tulsi Gabbard, who officially kicked off her campaign this weekend, tweeted during the speech that Trump "is incapable of unifying our country. He is a great divider. He was elected by and governs by fomenting division amongst us. "The Hawaiian Democrat also took aim at Trump's claims that a wall would solve the "crisis" at the southern border. "The root cause of mass immigration on our southern border is our history of US military intervention in Latin America that left countries destroyed. Before we talk about a wall, we need to end our ongoing threats of intervention - this time in Venezuela," Gabbard tweeted. One 2020 candidate did find common ground with the president — South Bend, Indiana Mayor Pete Buttigieg, who praised Trump in a tongue-in-cheek tweet after the president noted there are "more women serving in Congress than ever before. ""Thank you, Mr. President, for the tremendous role you played in getting Democratic women elected to Congress in record numbers!" the tweet said. In a Facebook post about an hour before Trump's speech — it was billed as a "pre-buttal" — Sen. Kamala Harris, D-Calif., said she couldn't believe "insincere appeals" for unity from someone who has spent his entire presidency trying to divide. "If last year's remarks are any guide, we're in store not for a speech that will seek to draw us together as Americans, but one that seeks to score political points by driving as apart," Harris said in the video post. She also went after Trump on income inequality and his demand for a border wall. "The strength of our union has never been found in the walls we build. It's in our diversity and our unity. That is our power," she said. Republicans, meanwhile, were united in their admiration of the speech. House Minority Leader Kevin McCarthy, R-Calif., offered praise for Trump's speech in a video message posted on Twitter that appeared to be recorded in advance. "President Trump just hit it out of the park," he said. "From securing the border, to lowering the cost of prescription drugs. His proposals are just common sense. Now, Democrats have a choice. They can continue to resist or they can choose to come to the table and work together to keep making America greater than ever. "Partisan back and forth was going on even before the speech, with Senate Minority Leader Chuck Schumer, D-N.Y., taking to the Senate floor during the day to say the state of the Trump union is "chaos" and describing his call for unity as "blatant hypocrisy." "Every year the president wakes up, discovers the desire for unity on the morning of the State of the Union. Then the president spends the other 364 days of the year dividing us and sowing a state of disunion," Schumer said. Trump responded on Twitter with a counterpunch. "I see Schumer is already criticizing my State of the Union speech, even though he hasn't seen it yet. He's just upset that he didn't win the Senate, after spending a fortune, like he thought he would. Too bad we weren't given more credit for the Senate win by the media!" Trump wrote. Schumer took to Trump's favorite medium to respond, tweeting back, "Thanks for watching my speech but you must have missed this line: 'Perhaps even more empty than his policy promises are President Trump's calls each year for unity.'"